Apple launches new iPad Pros with HDR screens | What Hi-Fi? Apple has rather surprised most of the tech world by announcing new iPad Pros at its WWDC event. The big news is that the old 9.7in model is no more, having been replaced by a 10.5in model. That's a 20 per cent increase in screen real-estate but, thanks to 40 per cent thinner bezels, the device is only marginally larger and still weighs less than 1lb (450g). The larger new iPad Pro retains the 12.9in screen size of its predecessor but benefits from all of the other upgrades made to its smaller sibling. 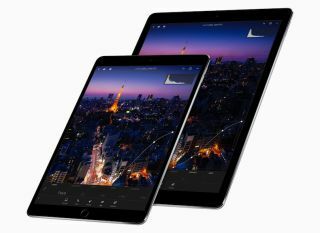 The extra size isn't the only way that the new iPad Pro's screen is upgraded from the outgoing model's - it's also brighter, at 600nits, supports HDR, and has a new feature that Apple is calling ProMotion. ProMotion gives the new iPad Pros a refresh rate of 120Hz, which, it is claimed, makes the entire user experience - particularly scrolling and swiping - smoother and slicker. What's more, that refresh rate can be dynamically adjusted based on the content you're playing, which should mean movies and TV shows are more authentically presented and also means that battery can be saved by reducing the refresh rate when possible. Speaking of the battery, Apple says battery life is still 10 hours, despite the larger screen size and a big boost in power - the new A10X Fusion chip is apparently 30 per cent faster in the CPU and 40 per cent faster for graphics. The optional Apple Pencil is still available, and there's a new, full-sized Smart Keyboard. In fact, even the onscreen keyboard is now full-sized, thanks to the extra screen space. The new 10.5in iPad Pro starts at £619 with 64GB of memory on-board, while the 12.9in version, which gets the same upgrades as the smaller version, starts at £769 in 64GB guise. Pre-orders are open now and deliveries start next week.